Photo courtesy of Rivier University Former Nashua South catcher A.J. Mele has done a good job handling the Rivier University pitching staff as a freshman this early spring. Thus the Raiders are trying to get more New Hampshire players into their program. 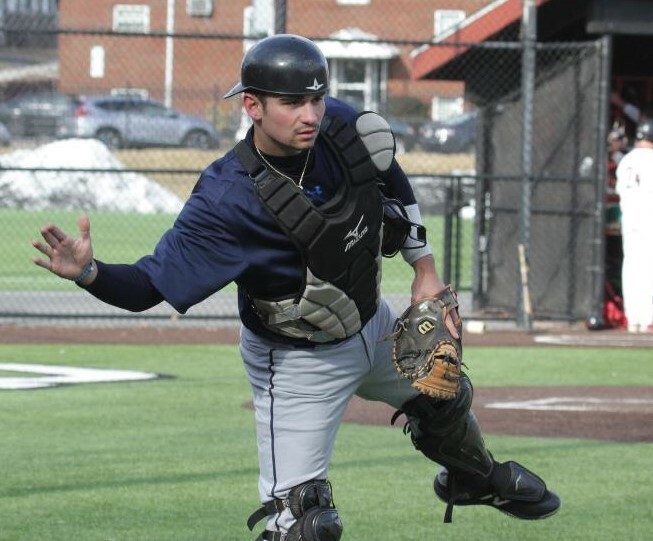 This year’s team has 10 freshmen, four from New Hampshire of which two are from the area – former Nashua South catcher A.J. Mele and former Merrimack pitcher Jake Mainey. The other two are from Salem – outfielder James Desmond and pitcher Corey Cochran. And Mele is holding his own at the plate, hitting .269 at last look. Mainey, meanwhile, has picked up one of the Raiders’ three wins in relief, while Cochran has two wins, including a complete game shutout over Baruch College, with a 2.25 earned run average. A couple of other talented arms for the Raiders are sophomore Ryan Schaefe out of Everett, Mass., and senior Kyle Flanagan of Bradford, Mass. Flanagan is one of just four seniors on the Raiders, and one of them, infielder Jorge Martinez out of Methuen, Mass., leads them in hitting at .342 at last look. Meanwhile, starting center fielder Fred Kazalski, a sophomore out of Dracut, Mass., is second in hitting (.311) but leads the team in RBIs with 12. In fact, Kazalski was hitting leadoff but was moved to third in the order due to his run production. The Raiders were struggling otherwise at the plate at a team average of .202, but Perry says they haven’t forgotten about their mission – make opposing pitchers work. It’s a young team, and as Perry says, “What we need to get better at is the overall experience.” The Raiders did a season opening spring break trip to Fort Meyers, Fla., and in their first game against Thiel College of Greenville, Pa., they got plastered 26-6. But Perry saw something he liked, believe it or not. “Even though we were getting smoked, we kept working, we kept encouraging each other and supporting each other,” Perry said. “And we kept competing, not talking about where we were going to dinner that night, etc. The Raiders, who hope to get into Holman Stadium when it’s ready, have played a few of their games in the region at the New England Baseball Complex in Northborough, Mass. They begin conference play in Providence, R.I.on Saturday at Johnson & Wales. 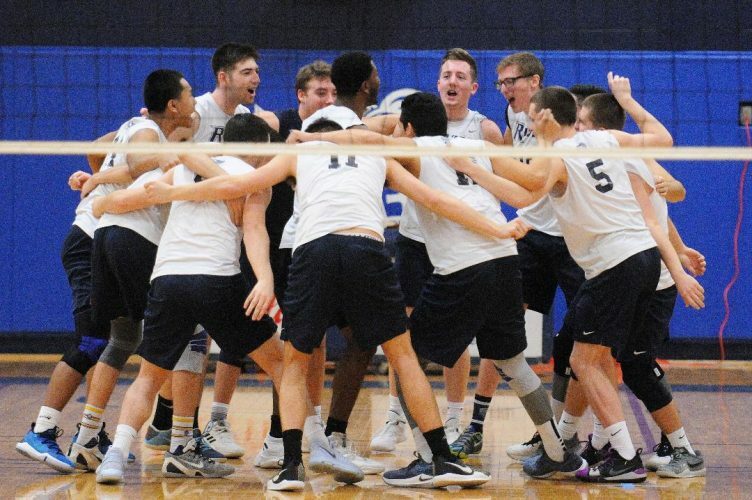 They’re one of nine Great Northeast Athletic Conference teams battling for six spots. Still on Rivier, there’s been a couple of honors coming the Raiders way this early spring. Men’s lacrosse standout Eric Guinnasso, a senior midfielder from Pelham, was named the GNAC Player of the Week. Guinasso registered nine points on five goals and four assists in a recent 17-7 win over Northern Vermont-Lyndon. He converted 55.6 percent of his shots into goals with 88.9 percent on target and scooped up one ground ball. The Raiders are off to a 4-0 start and Guinasso already has 14 goals on 20 shots. 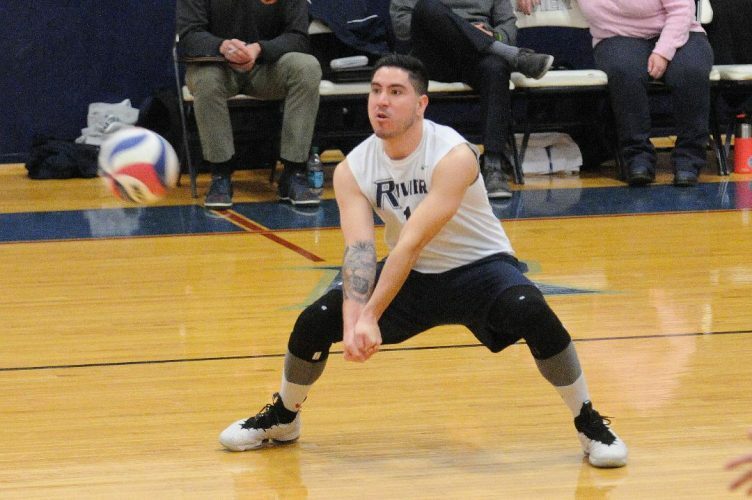 Meanwhile, Rivier men’s volleyball standout Khaynen Yocca, a senior from Pittsburgh (Pa.), was named the GNAC Offensive Player of the Week. In two recent wins he hit an even .500 with an average of 2.44 kills per set. He had 13 kills in a 3-2 win at Wentworth to go with seven digs and five blocks. Then he had nine kills in 14 tries vs. Johnson&Wales, a four-set Raider win. He is currently tops in the GNAC with a .388 hitting percentage for Riv, which was 14-7 overall at last look and the only unbeaten team in the conference at 5-0. Former Bishop Guertin standout Mark Zoda, now at Bentley University, had quite a freshman season for the Falcons. During the winter he earned Northeast 10 Swimmer of the Week as well as Rookie of the Week honors, and he helped Bently capture the Northeast 10 championship. Zoda was part of a record-setting 200 free relay team, but also won the individual 200 freestyle gold medal race in 1:41.53, as well as the 100 free. Zoda twice broke the school record in the 100, posting a time of 46.08 seconds in the preliminaries and 45.83 in the finals. That’s quite a freshman season. Spring track has begun for most schools and Southern New Hampshire University junior Alanna Murphy of Nashua ran a 15.92 in the 100 hurdles and a 1:15.03 in the 400 hurdles, and also anchored the Penmen’s eighth place 4×100 relay team in the recent Black and Gold Challenge meet in Orlando, Fla…. Merrimack’s Matt Brewster is off to a good start as a senior for the Franklin Pierce men’s lacrosse team with eight goals and three assists in the Ravens’ first three games.